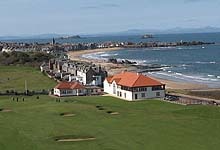 History of Golf at North Berwick. JOHN WHITE was born at Pefferside, situated between Scoughall and Lochouses, four miles east of North Berwick. The property was owned by the father of the well known East Lothian golfer Johnny Laidlay who White caddied for when Laidlay won the Amateur Championship in 1889. His father James White was an agricultural worker and later a greenkeeper while his mother Emily White (nee Thomson) came from a North Berwick fishing family. Jock White as he was known, moved with his parents to Ferrygate (1883) then Castlemains, Dirleton in 1889. He was educated at Dirleton School and from the age of ten caddied at North Berwick where he apprenticed as a clubmaker with Tom Dunn. When Dunn left for Tooting Bec G.C. in 1887 Jock returned to caddying and working on the land at Castlemains. Ben Sayers is credited with persuading White to give up the farm work and take up golf full time. On 12th May 1891 White was granted a license as a professional on the West Links. At the age of sixteen, White finished third in a local pro tournament, behind his two uncle's Davie Grant and Ben Sayers. In 1892, Mr John Penn MP for Lewisham was proprietor of Archerfield Estate and he engaged Jock White to look after the private golf course. That year White played in the Open Championship at Muirfield and finished eleventh which was an outstanding achievement for a teenager. 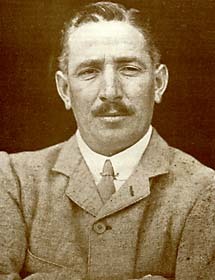 In 1892, White was appointed professional for a year at York Golf Club, a winter post he combined with being professional at North Berwick and Archerfield. White was also a stuffy match-player and as a youngster would not think twice about challenging the best players of the day. Although he did not win as much money as others, the brag matches made him into a tough aggressive competitor. Gate money was charged for the first time at a match between Douglas Rollard and Jack White at Cambridge in 1892. First entrance fee to be charged at an exhibition match was in 1892 at Cambridge when Jack White played Douglas Rolland. During the 1893 season he was based at Felixstowe and occupied eleventh place at the Open at Prestwick. In 1894 he was back at North Berwick before being appointed professional and greenkeeper for six months at Chesterford. He then moved to Saffron Walden for a year. Tom Dunn laid out the course at Worlington & Newmarket Golf Club and recommended his former apprentice clubmaker Jack White as their first professional. The club was granted the Royal Worlington title in 1895. White moved to the Prince's club in Mitcham in 1896 and that year he was thirteenth in the championship at Prestwick. He was professional at Seaford (1898-1901) on the original site at Seaford Head overlooking the Sussex Downs and English Channel. When Jock stood second to Harry Vardon at Sandwich in 1899, winning £20, he again entered from Seaford. On that occasion White created a record for the course (75), which stood for many years. He was fourth at St. Andrews in 1900, sixth at Muirfield in 1901, twelfth at Hoylake in 1902, and third the following year at Prestwick with 308. Willie Park asked Tom Anderson the head greenkeeper at North Berwick to recommend a man to be his foreman at Sunningdale where Park had recently laid out a course. Anderson suggested Hugh MacLean a gardener who had moved from Cluaine, Invernesshire to North Berwick and was lodging in the same building as Tom Anderson. An interview was arranged at Musselburgh and Park was so impressed with MacLean's knowledge and enthusiasm that he engaged him on the spot. In 1898 Hugh MacLean and his family resided at Kings Hill, Sunningdale. In 1939, his son James MacLean followed his father as head greenkeeper. The driver made by Jack White and used by Bobby Jones to win 11 majors is on display in the Augusta National Clubhouse. During this period George Thomson was the Starter at North Berwick and his faithful allie David Henderson was the Caddie-Master. His brother Alec Henderson was offered the post of Caddie Master at Sunningdale by Jack White the Club Professional but Alec turned down the offer. He suggested his friend Jimmie Sheridan and after a six month trail period at Sunningdale, Sheridan was offered the position of Caddie Superintendent a position he retained for fifty-six years. The North Berwick connection continued with the Club Captains of Sunningdale including John Laidlay, Robert Maxwell and Freddie Tait. John Laidlay resided in a property beside the Sunningdale course named 'Auldhame'. In March 1901, Jack White defeated Harry Vardon in his first match after his return from America. White had the advantage of playing over his own course at the Seaford Club and won the match six up with four to play. Among the spectators who followed the match was The Speaker of the House of Commons who presented Jack White with £25 prize. Jack White was one of the original members of the PGA, and in 1901 Tom Roberts a founder member of Sunningdale Golf Club persuaded Jock White to become their first professional. It was from there he entered the 1904 Open at Royal St. George's, which that year attracted 144 competitors, and an extra day was required. The Open started on Wednesday and it took until 7 o'clock in the evening before the first round was completed. Robert Thomson from North Berwick equaled the course record 75, set by Jock White in 1899 and led the championship after the first round. Harry Vardon carded rounds of 76 and 73 to lead the field by two strokes. On the final day Vardon went round in 79 and Braid caused a sensation when he played the front nine in 31. On the back nine he dropped only a single shot at the 16th with a record 69. White went round in 72 and Taylor 74. As a result Braid was the leader at the end of the third round on 226 with White on 227, Vardon on 228 and Taylor and Tom Vardon on 229. White completed his final round in 69 with the help of some long putts to finish on 296 - the first time 300 had been broken in a 72-hole Open. According to The Scotsman, the drama was not yet over. Braid had taken 67 strokes for 17 holes for a total of 293 three behind White. There were no scoreboards on the course and Braid had been told, incorrectly, that White had finished on 297. On the last hole, Braid was on the green in two, and thinking that he had a stroke in hand, played his 12-yard putt short to finish on 297. Taylor was still on the course needing an apparently impossible 67 to tie White. Playing unbelievable golf, he was on 64 after 17 holes. His putt on the 18th to tie touched the lip of the hole and rolled past. White was the champion and received the gold medal and £50 in prize money. White received over 300 letters and telegrams, including one from his former Parish Church Sunday School teacher, the Rev. John Kerr at Dirleton. When White finished second to Vardon at Sandwich in 1899, he presented Kerr with the driver he had used, and again after his Open triumph, he presented Kerr with the driver. Sunningdale marked his Open victory by giving him a pay raise, a rent-free cottage named 'Point Garry' at Ridge Mount and £75. In 1897 Jock White married Elizabeth Proudfoot in Kirkliston, West Lothian. Following his triumph, Jack White as he was known, received many offers to play in exhibition matches including one from the American magazine 'Golf'. They proposed to sponsor Jack White's trip to the USA to play the top golfers. The highlight being a head to head between the British champion and Willie Anderson, the American champion. Although Jack White was six years older than Anderson, he would have been aware of the head greenkeeper's son at North Berwick. In the 1890s, like many youngsters, Anderson would caddie after school and hang around the club makers workshop along with Jock White and the other professionals. In an interview in 1904, Jack White remarked that he was inspired to win the Open Championship by watching Walter J. Travis during the Amateur Championship at Royal St George's a week before the Open. Travis was born in Australia and at a young age he went to America and became a citizen of the United States, residing on 7th Street Hempstead, Nassau, New York. He was thirty-five years old when he took up golf and playing out of Garden City Golf Club he won the USA Amateur three times. Walter J. Travis sailed from New York on the SS.Arabic landing in Liverpool on 8th May 1904. He arrived early in Britain to practice for the Amateur Championship. Spending a week at St Andrews before moving to North Berwick where he was coached by Ben Sayers. When Jack White arrived at Sandwich to watch the Amateur Championship he met Ben Sayers who was making fancy bets and backing Scottish players. After the first round White was so impressed by Travis's play that he asked Sayers what he would lay him and he gave White ten to one which Jack took. White fancied Travis so much that he followed him round in every match. What impressed him most about Travis was his putting and his accuracy and certainty of the long game. He simply tried to get length, and place his tee shots at every hole to make certain of avoiding trouble and then depended on his deadly putting to win. Walter J. Travis was the first foreign winner of the Amateur Championship and 1904 Jack White and Walter J. Travis collaborated in writing a book called 'The Art of Putting'. With the national championship's of America and Great Britain in the hands of North Berwick men, this was a golden era for the town with a population of only 2,200. Unfortunately the battle to be 'world champion golfer' did not materialise as Jack White suffered from ill health and could not make the journey. The Sydney Morning Herald in Australia reported that Jack returned to North Berwick to convalesce and visit his parents living at 22 Quality Street, North Berwick. His only exercise was confined to playing bowls on the North Berwick green. White continued the tradition of the Challenge Match after Kirkaldy, Sayers and Park had passed their peak in 1899. When the new breed of professional like Vardon, Braid and Taylor arrived the exhibition matches became more popular, and by 1905 the team matches between Scotland and England attracted the backers. White played for Scotland against England in 1903, 04, 05, 06, 07, 09, 12, 13. His clubmaking was renowned and he won the Silver Medal for his driver and brassie at the International Golf Exhibition in Deal in 1909. This was somewhat ironic as his contemporaries record that the only weakness in his game was with the wooden clubs. He was a sound iron player, but it was his outstanding quality as a putter which stood him apart. He used a blade putter, and when faced with a short left to right, or right to left breaking putt, he would hook the ball off the toe of the putter, hitting it straight. A technique first used by Willie Dunn Snr. In 1905, White was amongst a group of professionals including Willie Anderson, Sandy Herd, Andrew Kirkaldy, Rowland Jones and Tom Vardon who were invited to San Pedro de Los Pinos in Mexico to play a series of exhibition matches. The President of the Mexican Country Club wanted to promote winter golf in the region, and attract the American's over the border. It was reported in the New York Times that money prizes were offered to the four foreign celebrities to induce them to make the arduous trip to Mexico. In 1904 Percy Beal was appointed assistant to Jack White at Sunningdale. Beal was born in 1887 in Seaford, East Sussex where he learned to play the game at Seaford Golf Club. In 1907 Percy followed Ben Sayers Jnr. from North Berwick as professional at Cuckfield Golf Club on Haywords Heath (1907-17). Percy set a new course record 70 before moving to Temple Golf Club, Berkshire (1922-38). In 1929 he played in the Open Championship at Muirfield. The hickory clubs made by Beal remain popular with collectors including the Percy Beal Two Tone Temple driver. In December 1905, Jack White sailed the Atlantic from Liverpool on the steamer S.S. Carmania with Ben Nicholls (New York G.C), Alex Herd (Huddersfield) and Rowland Jones (Wimbledon Park). They arrived in New York on 8th January 1906 and took a special train journey to Mexico. The event was played over the San Pedro de los Pinos links in the suburbs of the city of Mexico and was won by Willie Smith with Willie Anderson second and Alex Herd third. In February 1906, when the group returned to the USA a number of the British pro's stayed over to play Pinehurst and Palm Beach. Jack White was not well enough to play in any of the matches in Mexico City and was accompanied back to Scotland by Willie Anderson. In 1907 Jack White was invited to take part in the largest gathering of professionals in Europe. Organised by Grand Duke Michael of Russia and the Cannes Golf Club, among those taking part were James Braid, Harry Vardon, Tom Vardon, Sandy Herd, Arnaud Massy, Ben Sayers, and Ted Ray. The tournament carried £150 in prize money and £150 in expenses. Arnaud Massy was the only French representative and was a surprise winner of the stroke play event. Among Jack White's customers at Sunningdale was Bobby Jones who played the course during the regional qualifying rounds for the Open Championship in 1926. While visiting the pro's shop Jones picked up a beautifully crafted driver made by Jack White. It had a deep face with lead arranged to impart over spin, lower flight and longer run. White named the club Jeanie Dean after the Scottish heroin from Sir Walter Scott's novel The Heart of Midlothian. Using his new driver Jones shot 66 in the qualifying round which he described as the 'greatest round of golf he ever played', Jones had 33 shots and 33 putts. The driver seemed to inspire him into winning the Open Championship at Royal Lytham and St Annes and he never used any other driver in competition, wining 10 Majors with it. The driver made by Jack White is on display in the Trophy Room at Augusta National Golf Club. The Prince of Wales, who White frequently instructed, obtained a similar driver. Sunningdale was also the venue for the News of the World Match Play tournament from 1903 and the blue ribbon amateur event - the Golf Illustrated Gold Vase from 1910. At this time White employed six club makers. Jack White was the nephew of Ben Sayers and Davie Grant, and his brother-in-law, Wilfred Thomson was professional at the Hermitage County Club in Virginia. Walter Travis, the first overseas golfer to win the British Amateur Championship in 1904, co-authored a book with Jack on ' the game within a game' called The Art of Putting. 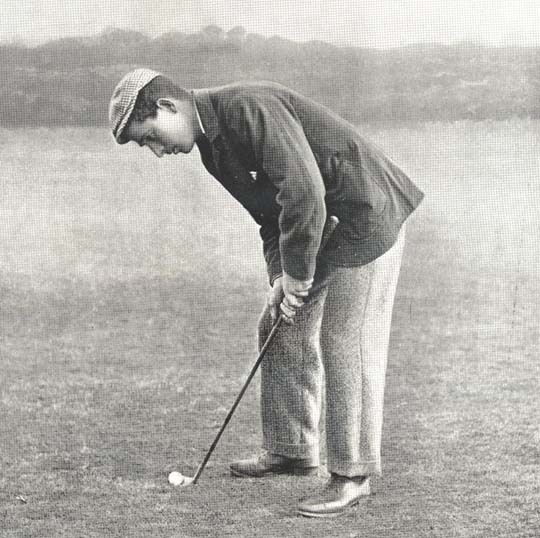 Australian born Walter Travis won the British title using a centre-shafted putter, which was subsequently banned for many years. He also won the U.S. Amateur Championship three times, and was a contemporary of Dorothy Campbell from North Berwick. Jack White won the Silver Medal for his driver and brassie." In 1914, Jack White took part in a week long indoor exhibition at Harrod's in London with Ted Ray, George Duncan and Harry Vardon. This was the first of numerous department stores using demonstrations and free lessons to sell their sports merchandise. At the start of WW1 Jack White enlisted as a private in the London Scottish regiment. His wife continued the business with two young lads helping. Jack had eight club makers, six were conscripted into the army and two went to Woolwich Arsenal. An apprentice club-maker with Jack White at Sunningdale was Duggie Given and William Gosden who emigrated to Australia in 1925 and worked for the Golf Supplies Limited in Sydney. Maurice Bowyer, a former apprentice at Sunningdale, later said Jack White was sacked in 1926 for 'drinking and womanising' and almost immediately after that event he formed the Jack White Golf Co. and returned to Gullane were he started a clubmaking business in the property next to the present professionals shop and later in a two storey building (now demolished) 'Hopetoun Golf Works' in Goose Green Mews. His first apprentice was W. J. 'Bud' Russell, son of Sandie Russell, the starter at Gullane No.1 course. Bud Russell emigrated to Australia in 1930 and was appointed pro at Barwon Heads Golf Club, Victoria where he remained for 57 years. Another apprentice, Hugh Watt became professional at Barnton, before being appointed to Gullane Golf Club. White opened a successful golf equipment shop at 2 Rosebery Place and for many years gave evening class lessons on the art of club making which were very popular. White was making clubs towards the end of the hickory period, but the wood was so poor quality he contacted Hardy Brothers of Alnwick a fishing rod manufacturer who supplied him with split cane which White used for his shafts. When the R&A made steel shafts legal in 1929, the increase in popularity of steel-shafts was rapid. In 1934 Jack White ceased making his Sit-Rite and autographed clubs with bamboo shafts and began to make steel. The Lillywhite family museum in Florida still displays Jack White/Hardy bamboo clubs. Jack White terminated his association with Hardy and withdrew from the 1934 British Industries Fair, the Lillywhite company bought the entire stock of Jack White Palakona clubs. In 1929, Jack White visited America and played in the USGA Open Championship when he all but stole the show in the first round. He scored 72 even par at Winged Foot Golf Club, Mamaroneck, NY. At that point he was fifth and even though he weakened and was forced to withdraw in the second round he proved beyond doubt that he retained all his old time skill. Several of his clubs are on display in the USGA Museum at Golf House including the iron cleek he used to win the Open in 1904. Jack White lived for a period at 45 Middleshot Road, Gullane which he named 'The Fairway'. In 1928, he asked the Honourable Company for permission to open a professional shop at Muirfield. This was granted, but to avoid conflict with the clubmaster who had previously sold golf balls to the members, White did not pursue the matter. In 1931 White followed his uncle George Thomson as pro at Longniddry Golf Club but only lasted a year. His business began to suffer as he failed to invest in new manufacturing technology. By 1937 his finances were in such a precarious state, he sold the shop and factory and moved to 30 Mortonhall Terrace, Musselburgh. In 1938 he was appointed professional and starter to the newly opened course at Monktonhall (Musselburgh Golf Club). Jack's wife Elizabeth Proudfoot died 9th March 1949 and Jack White followed her to the grave sixteen days later on 24th March 1949. They are buried in Inveresk Churchyard, Section G. layer 1305 with no headstone just a simple tablet engraved with 'J.White'. A sad end to an illustrious career without a headstone to mark the passing of an Open Champion. Jack White remains the only East Lothian golfer to have won the Open Championship. There are three fine examples of his clubmaking skills in the British Museum of Golf, including a mashie-niblick c 1904; a jigger c 1915 ; and a mid-iron c 1925. The Scotsman - Ian Wood's final 'Slice of Life' column 2011. "Musselburgh's old championship nine-holer was a rich source of memories, though it was at Monktonhall that I first got on speaking terms with a golfing great - Jack White, the Open champion of 1904. He told me to clear off." Charles Gibson was a clubmaker with Tom Dunn at North Berwick while Jack White was serving his apprenticeship. Gibson was appointed clubmaker to the Royal North Devon Golf Club at Westward Ho! where he trained J. H. Taylor, five times Open winner. Jack often visited his former colleague and it was custom to leave a short poem in the family autograph book in appreciation of their hospitality. Nae honest men, nor bonnie lasses. © Rodger Gibson (grandson) South Carolina.